Royal Air Maroc, is adding an additional ATR 72-600 to its fleet. This will bring its total ATR 72-600 fleet to six aircraft. The aircraft will be delivered before the end of the year and will be configured in the same dual-class configuration as the airline’s current ATR fleet. Copyright Photo: Royal Air Maroc Express ATR 72-212A (ATR 72-600) CN-COH (msn 960) (Ole Simon). Image: 927519. This entry was posted in Royal Air Maroc, Royal Air Maroc Express and tagged ATR 72-212A (ATR 72-600), CN-COH, msn 960, Royal Air Maroc, Royal Air Maroc Express on November 29, 2018 by Bruce Drum. 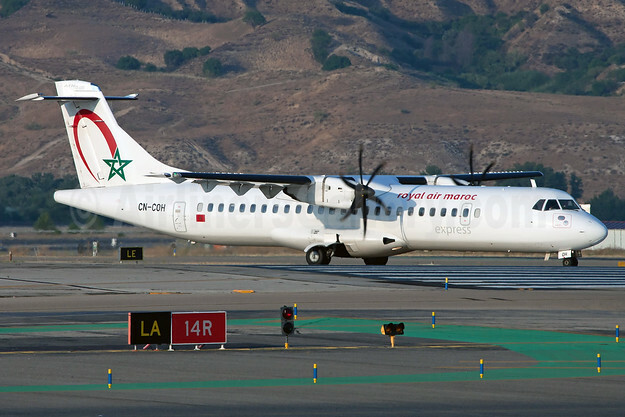 Royal Air Maroc (Casablanca) today (June 16) signed a previously-announced contract for the purchase of four ATR 72-600s and two ATR 42-600s for its new Royal Air Maroc Express subsidiary. RAM also secured options for two additional ATR 72-600s. Deliveries will start in 2011. In the meantime in order to launch Royal Air Maroc Express, RAM is leasing four ATR 72-200s from ATR. The first, ATR 72-202 CN-COD (msn 483, ex F-WKVC) was accepted on June 12.. This entry was posted in Royal Air Maroc, Royal Air Maroc Express and tagged ATR 42-600, ATR 72-200, ATR 72-600, Royal Air Maroc, Royal Air Maroc Express on June 16, 2009 by Bruce Drum. Royal Air Maroc (Casablanca) will launch a new regional subsidiary called Royal Air Maroc Express this summer. RAM is leasing four used ATR 72-200s from ATR as an interim measure in order to start the new airline. The parent has also ordered two new 48-seat ATR 42-600s and four new 70-seat ATR 72-600s. The new aircraft will start to arrive in the spring of 2011. This entry was posted in Royal Air Maroc, Royal Air Maroc Express and tagged ATR 42-600, ATR 72-200, ATR 72-600, Royal Air Maroc, Royal Air Maroc Express on March 28, 2009 by Bruce Drum.